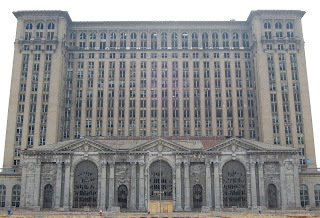 Michigan Central Station was the main passenger railway station in Detroit. It was built for $15M (in original 1913 dollars), and more recently purchased for just $80k (in inflated 1984 dollars). It's huge and magestic, but has suffered decades of neglect and will likely be demolished.